I do feel lucky to have such a lovely schedule. I take my kids to school, I usually meet the wonderful talented Netty from HomeBird Bakery who makes all our PlainStitch cakes at the school gate and get given an enticing tin of something lovely, then Hels and I wander up to The Workroom in the centre of our village and then the fun begins. Everyday our little doorbell rings steadily all morning. Each visitor brings with them something amazing that they are working on. We get to share all of the ups and downs, the triumphs and the disasters, the pride of perseverance, and the confidence that trying something you think will be so hard and achieving it, brings. Today was no exception, The Workroom was busy busy as the rain lashed down outside and lightening and thunder rolled. The sewing machines hummed, hand sewing was meticulously completed, chat and cakes enjoyed. Just some of the highlights as I'm always too busy to remember to take pics! Julias Amazing Massive Swoon from the Wendover Sewing Bee Swoon-along was squeel-tastic! Can you believe that this is the back of her Swoon top?!? She's already made the beautiful front - I don't know how she'll ever decide which side is which! Kathy's gorgeous, perfectly balanced Log Cabin from our Log Cabin Workshop Class this spring was nearing completion - basted and starting to be quilted. Next she's looking to the Gee'sBend Quilters for inspiration - I know her quilts are just going to get more and more exciting. Aren't we lucky to share these adventures in creativity?! To top out our exciting day we ended up being interviewed for BBC Three Counties Radio about our passions - sewing, our community Bee, sharing our love of creativity and making - we were super nervous but it was a blast, could have happily wittered on all afternoon ( you can listen again here we are at 2.15pm) . Then last stop of the day - the always serene and warm and welcoming Lady Grey Tearoom for an elegant pot of tea and a delicious scone with our champion cheerleader Mary, then back to school. It's amazing what you can fit into a school day. Hope your day was brimming with creativity too! Now I have a pretty 'well developed' stash of fabric at home (ahem), but nothing says spring like a spring clean. While the rest of my house got a cats lick and a promise - my fabric stash has just had the mother of all turn outs in anticipation of our Great Swap Shop at The Wendover Sewing Bee on June 3rd at St Anne's Hall in Wendover 9.30am- 12pm. It's a simple concept. Turnout your fabric stash. Figure what you're going to swap. I'd urge people to think 'what would others WANT?' as well as what do you want to swap out of your stash as we want as many tempting bundles as possible. Weigh your bundles into approx 100g bundles and put in a sandwich bag. Remember to pimp those bags ladies - think about how to make your bundle as tempting as possible for other swappers...colour code your fabric, put together a ready picked little selection of colours, add some ribbon or ricrac -whatever you think will make your parcel swapable. Each bundle can contain anything from one piece of fabric to a lot of scrappy bits, in pieces or cut into squares - anything goes, it need not only be fabric but wool, felt, buttons or ribbon are also swappable. I love, love, love that sewing is at it's heart about making do, using what you have, trusting to serendipity...a fabric swap is the ultimate opportunity to jump start a project through that perfect piece of fabric that you pick up.........get stuffing those sandwich bags! We'll start taking bundles from 9.30am with the swap kicking off at 10am. Each bundle will 'buy' you a token to be exchanged for another bundle. Come along and join in - all welcome. Lotus Pond + Clutch bag = as you can see I've had a happy day! After a full day and night of classes at The Workroom the Lotus Pond is something of a puddle so get in quick if you want some, we're open on Thurs and Fri this week. I'm super excited about our Pop Up Classes- we're kicking off with pincushions in June, and we'll be announcing Purse Class soon. So much exciting making going on at The Workroom this week, Simple Sampler quilts coming to fruition, Wonderful Farmers Wife quilts also nearly pieced - then kicking off fresh, modern Modern Applique Quilts and super saturated EPP projects ready for summer sewing. There's so much creativity bursting out of The Workroom at the moment that the place is literally buzzing with ideas, colour schemes, project plans keeping people awake at night......it's a joy to be at the centre of! OOh its even lovelier in the flesh than I had imagined and it's going to make such lovely English Paper Piecing! I'm already wondering about making lily pad patterns - yummy - I love a creative challenge. We've also imported a huge tunnel of my all time favourite premium quilting hoops. These are just a tactile joy to own and quilt with and we'll have them in The Workroom to try next week. 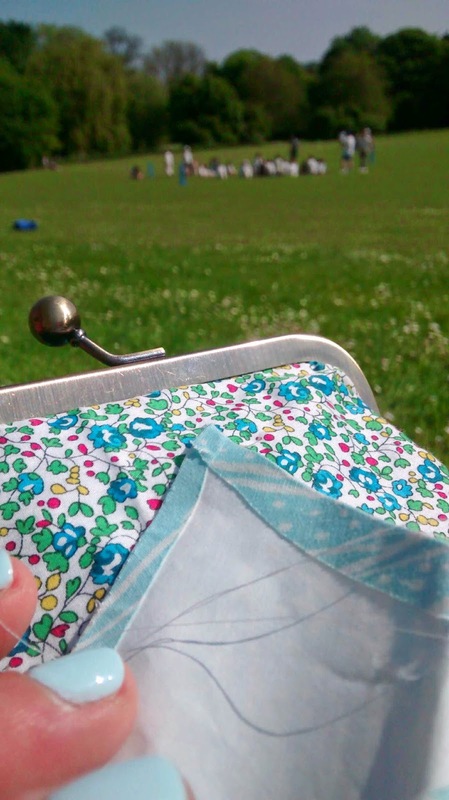 I'm just loving this blast of summer sun - this was pretty much my whole day today, three delicious hours of EPP + Cricket in the sunshine - I'm going to need another EPP project at this rate if the sun stays out! Enjoy the weekend wherever you are. The sun is shining and I'm having so much fun working on class samples for some little pop up classes we're planning to sprinkle our schedule with over the next few months. We fancied some quick fun sewing for the summer and thought we'd share the love by offering some little one off classes that we'll put on whenever we can find a schedule gap at The Workroom. You know by now that I definitely suffer sewing obsessions. When I find a project I love I sort of do it to death! The Lampshades was definitely an obsession. It's actually been a little while since my pin cushion obsession began - but it's really been since I owned this lovely basket at The Workroom that it's really spilled over! There's a need to fill that lovely baskets with pincushions and I am happy to fill that need! We thought we'd kick off with a Pop Up Pin Cushion MakeAlong. 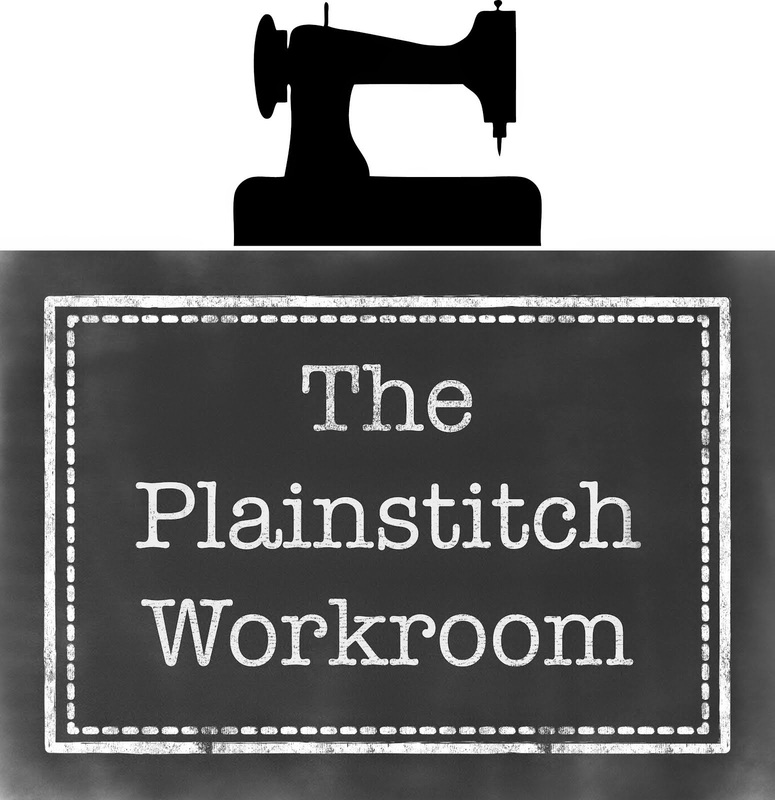 It'll be a short and sweet morning at the workroom on Friday 13th June, 10am - 12pm. Come along with scraps of treasured favourite fabric, buttons trim, ribbon, felt - I've got the wool balls - and lets play! Details on the Classes page. I'm also having a little bit of a new pash on fabric purses. They are ridiculously easy to make and why so expensive to buy, but imagine if you could make your own? Any colour you wanted? Any fabric you choose? Patchwork purse? You know I'm all over it! Purses every which way! I'm waiting on purse frames to ship (i'm so fussy about these - I only love these simple vintage bronze ones) so as soon as they arrive we'll just announce a pop up purse class too. Helen has a page of interested names, so drop her a note if you want to be added. Lastly I'm LOVING working on a pinny class. I do love a nice pinny - it's one of life's small pleasures! The more 1950's housewife the better as far as I am concerned. So I matched my nails to the fabric for the front of my pinny ( don't judge me - I get a colour on the brain). I'm trying out a new pattern for a class that will also probably just pop up when i'm happy with the pattern - watch this space! OOhh I I must just mention that we have very exciting new fabric arriving at The Workroom on Monday - Rae Hoekstras new Lotus Pond range - It's going STRAIGHT in my summer EPP project so if you want some before I use it all, hot foot it to the Workroom next week, we're open Tuesday 9.30am - 2pm and 7.30 - 9.30pm and Thurs and Fri 9.30pm - 2pm. Last but not least check out the Wendover Sewing Bee Blog page for details of our Great Fabric Swap Shop in June. Come prepared with fabric to swap and a healthy respect for your fellow swappers, gloves off, lets swap! So it's raining again? Go sew! We've been so busy at The Workroom these last couple of weeks. Our Modern Applique class has just begun and some fabulous first blocks are starting to emerge. A bit of spring sunshine at the end of last week was perfect to inspire us starting this quilt pattern. I love making this quilt so much that I've made three versions now. I'm resisting the temptation to make another one in these fab colours. This block is destined to be a cushion instead. We've been getting new fabric in all week. Lots of great hard working basics. This bundle is calling to me. Raspberry Flurry, grass green Gingham and Flurry and soft grey Tilda - it's a perfect Modern Applique palette. We've stocked upon reds - they've been flying out. A lovely crimson coloured Flurry dot, some vintage cherries and a restock of our favourite Home School range red gingham. We've also stocked up on blues, classic polkas a Home School gingham and a new soft blue flurry. It's been raining hard outside all day today but The Workroom was busy and buzzing - pop in and see us, we're open on Saturday 10am - 3pm or at the John Hampden School Spring Fayre 12-2pm. I just finished sewing the binding of my Bee in My Bonnet Quilt while the sun still shone earlier this week. It'll be at The Wendover John Hampden School Fayre trying to bring a bit of sunshine back! Pop by and say hi.